Lockpicking is the art of opening a lock through the analysis and manipulation of its components without using a key intended to open the lock. The process is generally non-destructive and covert, and is contrasted with various forms of destructive entry. When dealing with the opening of safes or vaults, it is referred to as safecracking. 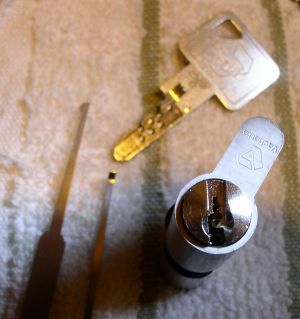 A bypass is technically different than picking the lock, though there are many similarities between the two techniques. Lockpicking is made possible by small irregularities during the manufacturing of locks. Small variations in the size, shape, and alignment of components allows for picking tools to be used to pick the lock. Depending on the type of lock, different methods of picking may be available. The practice of recreational or competitive lockpicking is known as locksport. Theoretically, lockpicking has existed as long as locks themselves. Early locks, from the Romans until Barron's invention of the double-acting tumbler in 1778 relied solely on wards. Warded locks were usually opened by a skeleton key, cut away to pass any and all wards which might be in the lock. 'Skeleton key' could mean any skeleton-like instrument achieving this purpose, such as a piece of bent wire. (It does not include bit keys for lever locks.) Robert Barron patented [BP1200] the principle of all modern mechanical security locks — the double-acting movable detainer. Thereafter, tentative picking was developed, using 2 instruments. One applies a binding pressure, the other moves whatever movable detainer is obstructing the movement of the bolt (or plug, in a cylinder lock). A pick designed to manipulate individual components is used. Single pin picking focuses on the irregularities of each individual component to determine the order of binding and proper position of each component. Commonly referred to as single "pin" picking, but applicable to non-pin locks, too. Though many pick types are suitable, the classic hook shaped pick is most appropriate. A pick designed to manipulate many (or all) components is used. Raking focuses on rapidly varying the position of components in the lock to simulate a wide variety of key depths. Raking is especially effective if the proper position of components is in a predictable pattern, such as a staircase. Picks specifically designed for raking are known as rakes. A pick gun is designed to hit the bottom of all pins and transfer energy to the pin stacks to allow for rapid opening of the lock mechanism. Vibration picks fall into this same category. A key with depth cuts to the lowest positions. Key bumping is a fundamental problem in most pin tumbler locks that allows for energy transfer between the bump key and the pin stacks to allow for rapid opening of the lock mechanism. This is similar in function to the use of a pick gun. A set of keys modified to different depth positions. Tryout keys take advantage of poor tolerances in locking components. While most locks represent themselves as having a large amount of theoretical key differs, some have very few due to poor tolerances. A pin-tumbler pick designed to move all pin stacks out of their blocking position by pushing them into the cylinder chambers, allowing the plug to rotate freely. The process of duplicating or otherwise simulating the action of a proper key for the target lock. Impression can take many forms, some of which are not strictly classified as lockpicking. The process of decoding the position of internal components either through manipulation of components, disassembly of the lock, or analysis of the key. Decoding can take many forms, most of which are not strictly classified as lockpicking. The specific tools used to open a lock depend on the design of the lock and the preferences of the lockpicker. Traditional picking of most locks involves both picks and tension tools. The pick is used to manipulate internal components to their unlocked position and the tension tool is used to hold the components in place and retract the locking bolt once the lock is picked. When all components are in the unlocked position the lock is free to open and considered picked. This applies to pin-tumbler, tubular/axial, dimple, and lever locks. Most forms of lock picking are covert rather than surreptitious as minor scarring can occur to the face and pins of the lock that can aid in forensic analysis. Warded locks are distinct because they do not require a tension tool to be picked; only the picking tool is used. Combination locks generally do not require tools unless they are a hybrid locking design. Most combination locks are opened with decoding or bypass rather than picking. Handcuff locks that use a warded design can be picked with simple tools, including paper clips, bobby pins, and traditional pin-tumbler or warded lockpicks. Most handcuffs can be bypassed via shimming or manipulation of the ratchet arm instead of attacking the lock mechanism directly. Lockpicking has been portrayed in many television shows and films. Often techniques and tools are incorrect, with the most common mistake being the lack of a tension tool. In most cases the lock is picked almost instantly, which misrepresents the difficulty and skill involved in picking the majority of locks. WIRED Magazine. The Untold Story of the World's Biggest Diamond Heist.